2018 Mr. PCH contestant Henry Eubank makes his entrance and does a handshake with then-senior Meghan Kane during the Mr. PCH Pageant. 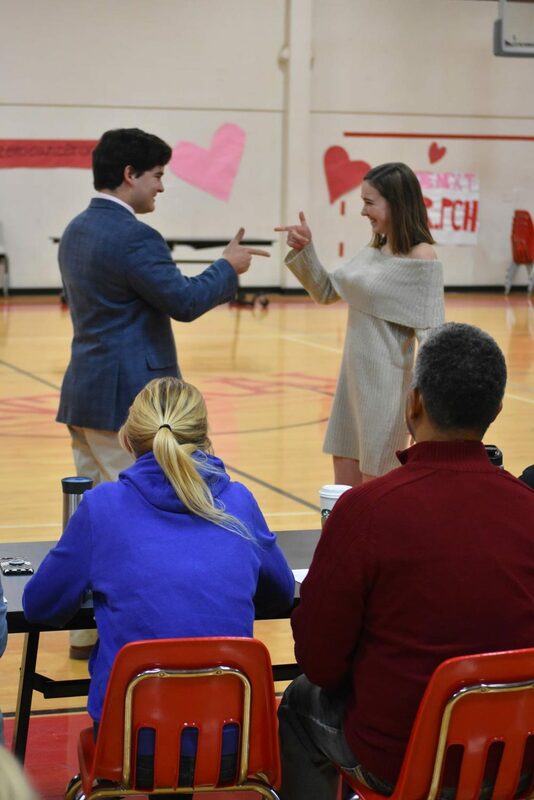 The King of Hearts dance (KOH) is the only dance at Parkway Central that allows the girls to do the asking of the dates, this is traditionally known as a Sadie Hawkins dance. This year the dance is being held February 9 in gym b for the first time ever. After homecoming was a big success in the smaller gym, STUCO decided it was time to make the switch for KOH too. If it’s your first time attending the girls ask guys dance there’s a few things you need to know first. First thing first is the proposal, this is optional. It’s a fun way to embarrass your date whether it be a significant other or your best friend, but I know plenty of people that skip out on this every year. A simple text can get the job done. The next steps are the most stressful but definitely manageable, planning a dinner group and making the reservation. If you go in a giant group it may be hard to find a restaurant to accommodate that many people at once so you need to make sure to be on top of this. I personally find it easiest to go with a group of 8-10 so that you still can be with a variety of people but not completely overwhelming for the restaurant. Formal shopping is also highly important, casual dress wear is NOT allowed. The week before the Saturday dance is known as “KISS” week, each day is designated a dress up day. This year includes the following, Monday: Road Trip day, Tuesday: Hawaiian, Wednesday: Wild West, Thursday: Tundra, Friday: Freedom. Doors open at 7:30 and close at 10! Plan accordingly.